As the United States continues to tear-gas and imprison asylum seekers on the U.S.-Mexico border, we wonder why so many Hondurans are fleeing their homeland, now one of the most violent countries in the world due to a devastating drug war and a political crisis stemming largely from a U.S.-backed coup. 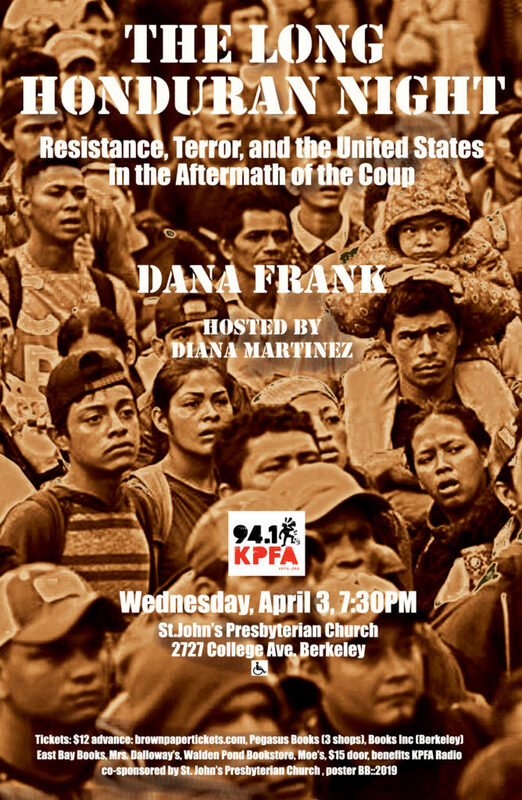 Dana Frank’s powerful narrative recounts the tumultuous time in Honduras that witnessed then-President Manuel Zelaya overthrown in 2009. Told through first-person experiences layered with deeper political analysis, this narrative weaves together two perspectives; first, the broad picture of Honduras since the coup, including the coup itself and its continuation in two repressive regimes; secondly, the evolving Honduran resistance movement, plus an emerging solidarity movement in the United States. While full of disturbing incidents, this narrative directly counters mainstream media coverage that portrays Honduras as a pit of unrelenting awfulness, in which powerless sobbing mothers cry over bodies in the morgue. Rather, it’s about sobering challenges and the inspiring collective strength with which people can face them. Dana Frank, Professor of History Emerita at the University of California, Santa Cruz, is the author of Baneras: Women Transforming the Banana Unions of Latin America. Since the 2009 military coup her articles about human rights and U.S. policy in Honduras have appeared in The Nation, New York Times, Politico Magazine, Foreign Affairs.com, The Baffler, Los Angeles Times, Miami Herald, and many other publications, and she has testified before both the US Congress and Canadian Parliament. Diana Martinez is a native of El Salvador. She graduated from medical school in Mexico City and worked as a community doctor in rural Mexico. Later she served in the conflict zones as part of the liberation movement during the war in El Salvador. Subsequently Diana returned to academics to study public health and demographic sciences. After doing a fellowship at UCSF, she coordinated innovative research in health literacy, reproductive health, pesticide exposure, and chronic disease among Latino immigrants and farm workers across California. Through her use of multimedia in public health education interventions, Diana became passionate about radio production. She graduated from the KPFA Apprenticeship program and has since been involved at the station as a producer for more than ten years. Currently she is KPFA’s senior producer for Letters and Politics.